It is no secret that the AC-130 fleet is changing. Once defined by their bristling cannons, the new breed of AC-130s are all about guided bombs and a slew of smart weapons, with just a single, direct fire 30mm cannon being fitted. Luckily, sharper minds have prevailed at AFSOC and now the AC-130Js will get the massive 105mm cannon they rightfully deserve. Lt. General Bradley Heithold, the head of the AFSOC, swears by the AC-130's 105mm howitzer, told Breakingdefense.com that it's both more accurate and way less expensive than the precision guided munitions it was intended to replace. He credits the gun's precision to its lower explosive yield than even small guided bombs and missiles. The cost differential is also no secret – a 105mm howitzer shell costs hundreds of dollars, while a guided bomb can cost at a minimum tens of thousands of dollars or easily into the hundreds of thousands. Additionally, the AC-130's big shell can arrive on station in just a few seconds and re-attack rapidly, which is much faster than smart glide weapons or even missiles. General Heithold's plan is to slowly retire some of his middle-aged AC-130Us (the Vietnam era AC-130Hs are already on their way out) while awaiting the introduction of his newest gunships, with hopefully the third AC-130J receiving the 105mm cannon fresh from the factory. The first two AC-130Js will have to rely on a single bushmaster 30mm cannon, bombs and missiles until they can be upgraded with the new-old big gun. This will leave a fleet of about 26 AC-130s available at any given time going into the future. Originally, the plan was to shrink the AC-130 fleet as the war in Afghanistan drew down and Iraq was supposedly in the review mirror. That didn't happen and considering a terror state controls a land mass reaching almost from the Mediterranean to the Persian Gulf, not to mention the mess that remains in Libya and the one that is growing in Yemen, there are few better weapons to take on these threats than the AC-130. In other words, demand may have dipped for the big bristling gunships, but now it is climbing again, with no end in sight. Here's to General Heithold for doing-up America's next AC-130 the right way and keeping with what is inexpensive and highly effective over what is technologically flashy. 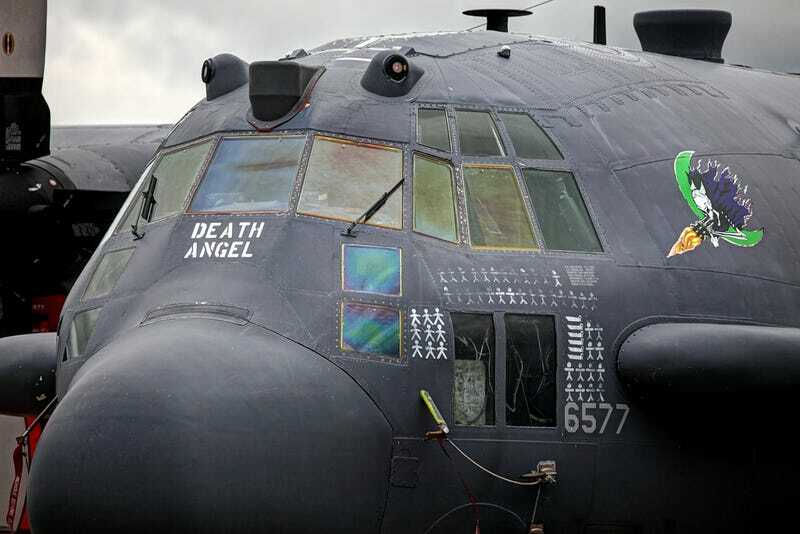 And here's to the upcoming AC-130J Ghostrider, an aircraft that is now looking more promising than ever, maturing into something more deadly, versatile and survivable, with directed energy weapons and advanced radar jamming capabilities on the horizon. Although the AC-130J is still yet to take to the skies operationally, take a few minutes and fly along on a some training missions aboard AFSOC's "legacy" AC-130 Specter and Spooky flying gunships.